What a beautiful picture we have of that first Christmas! Mary and Joseph, dressed in plain, but neat, clothes. 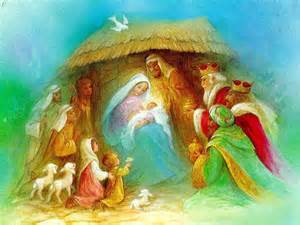 The baby is wrapped in a clean blanket and the shepherds and Wise Men all stand or sit on the clean straw. And one of our most beloved Christmas carols make it all sound so peaceful and clean. But was it a silent night? Was all calm and bright? According to the Gospel of Luke, Mary and Joseph had just made a long trip from their home town of Nazareth to Bethlehem. This would not be considered a “long” trip today. It is approximately 100 miles and MapQuest says it can be made in less than two hours. However, at the time of Jesus’ birth, travel would have been on foot on rough roads with no Holiday Inn or McDonald’s along the way. Mary may have had the luxury of riding on a donkey as our pictures always show, but even so with Joseph walking by her side, the trip would have been long and hard. I can’t imagine making such a trip while eight or nine months pregnant. Upon arrival in Bethlehem, Luke tells us there were no rooms available at the inn. The innkeeper is often portrayed as an unsympathetic man who refused a place for Mary and Joseph. However, if the town was crowded with visitors for the census and there were no rooms available, he may have acted out of compassion by providing a place for them in the stable nearby. At least there they would have a roof over their heads and some protection from the night. While we don’t know how old Mary was, most scholars believe she was probably a teenager. So – here is a young girl, found pregnant before she was married at a time when that brought great shame (and could have brought death by stoning), far from home getting ready to give birth in a stable. I’m not sure how calm she must have felt or how silent the night was as she gave birth to her son. I imagine Joseph – worrying about his young wife giving birth without benefit of the comforts of home, wondering how he was going to be able to raise the Son of God. It appears that shortly after giving birth, Mary laid Jesus in the manger. While trying to rest, Joseph and Mary had visitors. Shepherds. These w ere men who were on the bottom of the Palestinian social ladder. They would be placed in the same class as tax collectors and dung sweepers. In spite of their fantastic story of angels appearing to them with the wonderful announcement of the Messiah’s birth, only one of the Gospel writers – Luke – bother to tell us about them. Judaism’s written record of the oral law, the Mishnah, reflects this prejudice, referring to shepherds in belittling terms. One passage describes them as “incompetent”; another says no one should ever feel obligated to rescue a shepherd who has fallen into a pit. Being out in the field with the sheep for a long period of time, I can only imagine that their clothes may have been worn and/or dirty and they were probably in need of a good bath. Not necessarily a beautiful, neat scene. 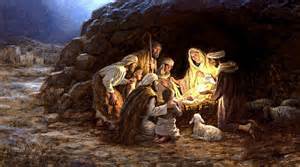 And you will recognize him by this sign: You will find a baby wrapped snugly in strips of cloth, lying in a manger. Certainly they would not have needed that sign if there was a radiant light streaming around the manger when they arrived in Bethlehem. The beauty of that night was not a calm, serene setting with radiant beams emitting from or around the baby. The beauty of that night was how clearly it showed the love of God – sending His son not to the king’s palace or the rich man’s house, but to a dirty, cold, dark stable. For God so loved the world that He gave His one and only Son! That’s the “real” story of Christmas! This entry was posted in Christian Life, Family Life and tagged Christmas, Compassion, Holidays, Holy Night, Mary and Joseph, Silent Night by Barbara Lane. Bookmark the permalink.